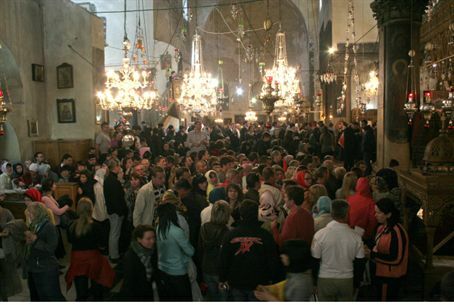 The PA plans a major EU-funded restoration project at the Nativity Church, which was damaged by PA terrorists in 2002. The Palestinian Authority has announced plans to conduct a restoration project at the Nativity Church in Bethlehem, which its own terrorists damaged eight years ago. Funding for the project will not come from the existing PA budget, and officials are hoping to get donations from European countries and the Arab world for the project. Ziad Bandak, a PA official involved in the project, told Associated Press writer Mohammed Daraghmeh that the restoration will be the first at the site since it was built in the fourth century. Rain has caused damage to the roof and other parts of the building, Bandak said. The building was also damaged in 2002 when it was used by PA terrorists in a standoff with Israeli soldiers. Monks who managed to escape during the standoff with help from IDF troops reported that the terrorists had beaten Christian clergymen and had stolen crosses and prayer books. Terrorists also started a fire at the site that cost tens of thousands of dollars' worth of damage, and left behind dozens of explosive devices. While the PA plans a restoration in Bethlehem, it has condemned Israel for a restoration project at the Western Wall plaza, which is adjacent to the Temple Mount, Judaism's holiest site. PA officials accused Israel of planning to harm the Al-Aksa Mosque. Arab leaders have frequently denied the Jewish connection to the Temple Mount and to other holy sites, such as Joseph's Tomb and the Tomb of the Patriarchs in Hevron. The PA's interest in restoring the historic church may be linked to growing Christian tourism. New pilot projects have allowed tourists staying in Israel to enter Bethlehem and Jericho with their Israeli tour guides. PA officials have also expressed interest in beginning new construction projects in order to find work for the several thousand PA Arabs who have been told to quit their jobs working for Israeli employers as part of a boycott of Judea and Samaria Jews. With an estimated 200,000 PA Arabs already unemployed, the boycott could leave more than 10,000 unemployed - and tens of thousands of dependents under the poverty line – unless foreign donations can be used to create new jobs.